Young Ideas Nursery School conducts sessions from September till June. A listing of school closings and/or holidays is distributed to parents at time of registration. In the event of undocumented closings due to inclement weather or unforeseen emergency circumstances, center will advise parents in sufficient time to make alternative child care arrangements. Information will be available through our school's telephone answering announcements, website notices and telephone calls. Tuition Fees are contracted on a monthly basis, therefore, no allowance is made for holidays, unscheduled closings, etc. Registration Fee - A registration fee is required when enrolling or re-registering your child. This fee is non-refundable. Tuition - Tuition fees are payable by the first of each month. A late fee has been established for payments not received by the due date. Tuition fees are non-refundable. Refer to current Financial Information Sheet for required deposits. Cancellations - Parents removing a student for personal reasons are subject to a one month cancellation notice. Less than one month's notice will result in a charge of the following month's appropriate monthly tuition fee. Our teachers and teacher assistants meet the standards as specified in the current Manual of Requirements issued by DYFS State of New Jersey. It is our philosophy that each child be recognized as a dynamic individual capable of actively participating in the planning and evaluating of his learning experiences. Through teacher guidance and participation, the child can attain important skills vital to his social, cognitive and physical development. The child is given the opportunity to develop his own feelings of worth, value and dignity leading to self-initiation enabling him to function well in his environment. 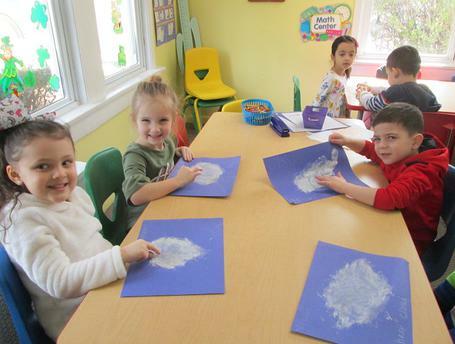 The child will participate in active learning where his direct and immediate experience of objects and the world around him leads to an important relationship between himself and his physical environments. We recognize the need for a cooperative educational plan involving all areas of development and foster an environment where the needs of these areas can be simultaneously met, initiated and developed.